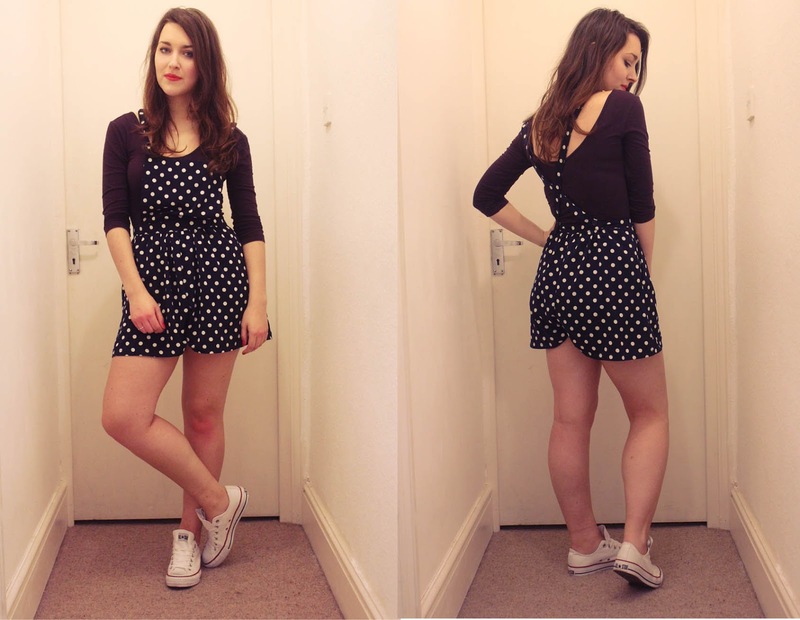 Polka Dot Pinafore - Miss Selfridge and Converse - Kurt Gieger. This outfit post is a lot more casual than my previous one but I hope you like it just as much. This outfit brought me right back to my childhood in the nineties, I felt like a five year old me in this polka dot pinafore from Miss Selfridge, can you tell I've been loving spots recently? I've wanted this pinafore/playsuit for a while, so when I was lucky enough to receive a voucher from work to spend anywhere in the shopping centre I work in I knew had to get this. With my student discount I got it for the bargain price of £15! Although living in England we don't get to see too much sunshine especially around this time of year, I feel that this outfit would be perfect for when we do get some. I've decided to keep the rest of the outfit very plain with a basic plum leotard and some converse, however if I wanted to wear this outfit now I would definitely have to wear some tights. Yes, the title of this post is a One Direction song, I wish I was sorry and I didn't like them but I can't help but love them and I am so jealous of everybody who's been lucky enough to see them on their latest tour. Definately my guilty pleasure! What did you think of this post and what would you like to see me post? Feedback/comments are always SO helpful! Also If you are feeling kind please nominate me for Company's Blog awards in the Best Personal Style Newcomer Blog here - It would mean the world to me! What I'm listening to: Send Me Down - Haim, My Number - Foals, Castro Dies - Jamie T & Lost in Your Love - Redlight. Loving this playsuit - so cute! Thanks I'll take a peek! That's such a lovely comment thankyou! oo I love this polka-dotted pinafore!! Thanks, it's from Miss Selfridge if you wanted to know! Love the outfit, you are gorgeous! I know, I got such a great deal! I'm a lucky girl!